This is my first link up with the girls from the #1 Word Blog LinkUp and my word for the week is "reality". It took me a moment to get my head around the concept of reality, but I think it comes back to is "what is real?" In this postmodern world we live in it seems to be about the image we project to others - "the wrapper is the reality" (in other words what is on show is what we want others to believe is our true self and our true life) As long as the wrapper appears pretty, it covers all the stuff happening on the inside. I was having this conversation with my good husband the other day in regard to facebook updates and Christmas newsletters (amongst other things) that I see from friends and family. 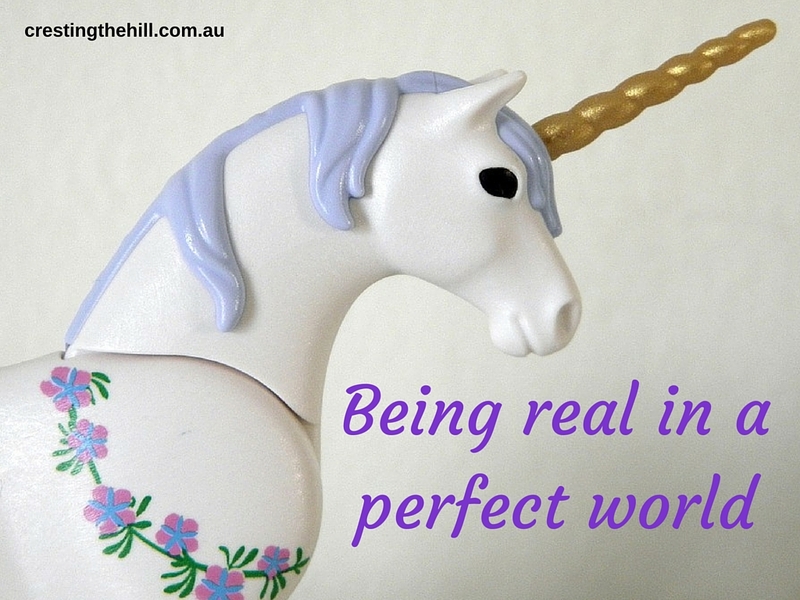 Everyone seems to project picture perfect family life, their delightful children/grandchildren, their latest purchases, their travel stories etc etc and the question is......Is that their reality or is it just a glossy picture that they share because they feel that everything needs to be perfect? Are we the only family whose reality is a little less shiny at times? I was also wondering whether it was a "church thing" and whether Christians felt that they needed to come across as perfect - because if things aren't all sunshine and rainbows then maybe God isn't blessing them. My husband didn't agree with me that it was Christians in particular that weren't being real, and at that point the conversation got interrupted by our daughter phoning......I told her that she had called in the middle of a discussion on whether Christians were real or not and her response was "What! Christians aren't real? So what? Are they like unicorns?!" Typical smart alec response from her but it did divert the conversation and we never really came to any deep and meaningful conclusions. There is a saying "your truth is your truth and my truth is my truth" (or something along those lines) and I think that also applies to people's versions of reality and how much of the not-so-lovely parts of their lives they share with other people. My husband gave an example of this with how much information he passes on to his elderly parents - he tells them the good stuff and omits the bad stuff because they'd only worry and stress and couldn't do anything about it other than get upset. I think that he has a valid point, but I still feel more connected to friends who share their good times and their not so great times - it makes me feel that we are on the same page and that my world isn't so bad after all. Reality is a very diffuse term in today's day and age - we shape it to fit what we want it to look like and each person has their own preferences of what they want to acknowledge to the world. Some choose to close their eyes to stuff they don't want to deal with, others gloss over the details and some just let it all hang out (which can make for interesting facebook posts at times!) I think it comes back to how your were brought up - how much reality your family chose to discuss and how much was swept under the rug. I love a real heart to heart conversation and I think that happens when reality is up front and centre. True friends accept each other warts and all - the glossy wrapper comes off and reality is shared and we find acceptance and love - and isn't that what real friendship is all about? I couldn't agree more and I think sometimes we all are guilty of putting a false reality out there especially on social media, like Facebook. So, I am truly glad for the reminder here today and so very happy you linked up and joined us this week. 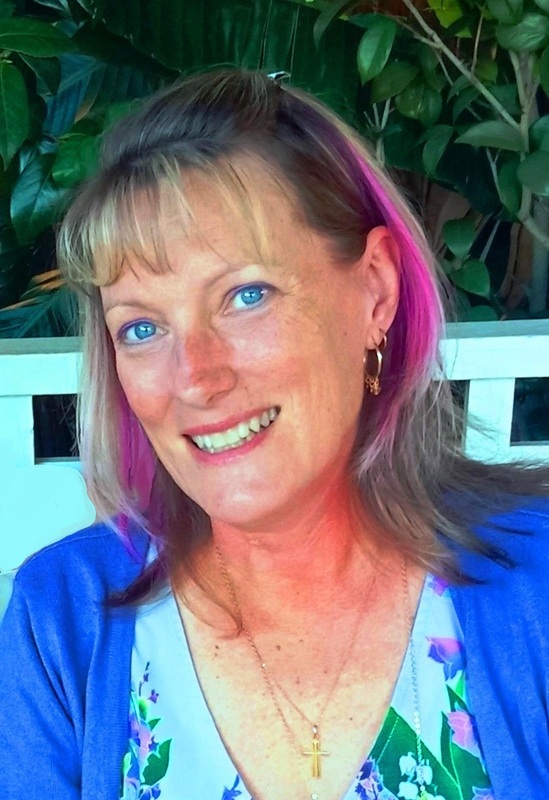 Thanks Janine for letting me join the link-up it's been a great way to get me thinking and I'm enjoying reading the other posts - we all think so differently! I do think that today we have so many avenues for constructing our own reality. It can be very powerful to transcend limitations or it can be a crutch for self-deception. And it can be hard to know which one I'm engaged in doing! Thanks for writing up your thoughts on reality. Thanks Karen - that was actually a very profound comment - now I have to think some more about the whole transcending limitations idea! Thanks Marcia - I'm really glad I found your group and I'm in the process of reading the other posts (time differences are tricky!) - it is nice to have something thought provoking each week. I think that because social media is so all consuming that we tend to gloss over things there because there are just too many people out there. When we are with people that we know and trust we are more open and honest. For example, I may tell my friend Lana that I am at my wits end about a certain problem, but I certainly wouldn't put that on Facebook for the whole world to see. There has to be a level of trust before people are willing to share their darkest secrets. We all have problems but sharing them with the world is not something I think anyone wants to do. That's so true Rena - a guy I know shares his 'miseries' on fb regularly and it gets to be a bit of a meaningless whinge after a while - true friendships are such an important part of being able to open up and not be judged but still be heard. Such a great analogy - the wrapper isn't the reality. I think a lot of it has to do with all the media we are bombarded with everyday. We have to remember that was we see on TV/Movies/etc. is n't always totally real. Movie stars are made up and have plastic surgery. News stations rarely tell the whole story of anything. 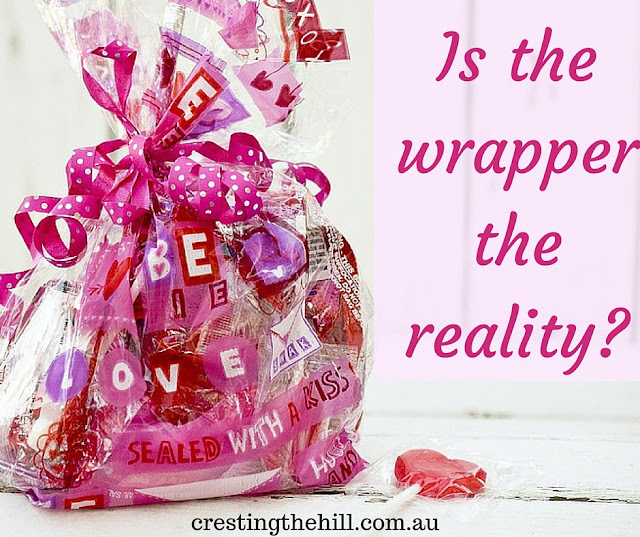 We definitely have to be more aware of the reality of what's inside the wrappers! Exactly Lisa! Everything we see is so manufactured and when we start comparing our life to it, it looks a bit dull and sad. The media has certainly messed with our perceptions of a lot of stuff. Hi! So glad you participated in #1Word so we could discover you! Love this post, a lot of our posts lately seem to share the common theme. We need to decide if the candy is delicious, based solely on the candy not the shiny wrapper! Thanks for the opportunity to share - I loved doing this and look forward to reading all the posts and having another shot at it next Wednesday!